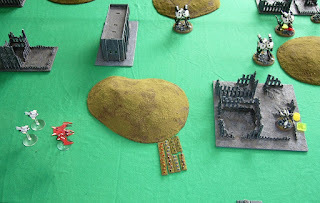 A second game using Titan Legions, this time at 4000 points, and against Tim's Eldar. 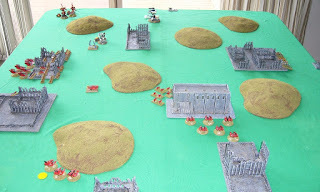 I took a similar list to last game, but taking three Warlords this time! 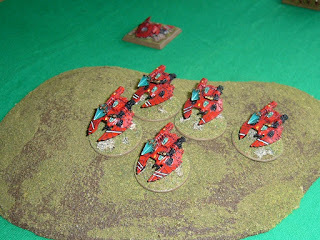 Tim used his beautifully painted Eldar, taking a Biel Tan list. Here's the setup, all my Titans on the right flank, with Warlords in the middle of the line. 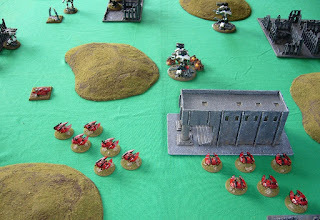 From behind my line. Eldar objectives, including webgate, are directly ahead. 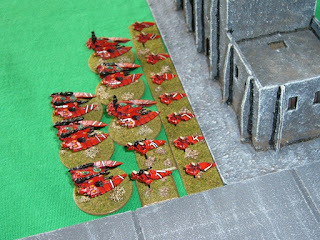 I storm forward with the Warlords, doubling and marching. 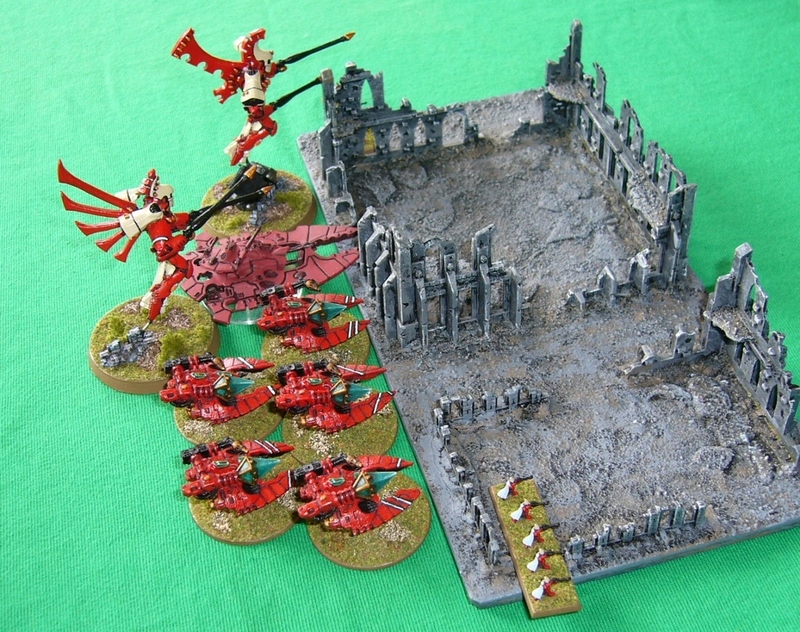 Eldar target the leading Warlord with their Void Spinner artillery, and then Shining Spears attack out of the webgate, with their armour piercing lances at the ready. 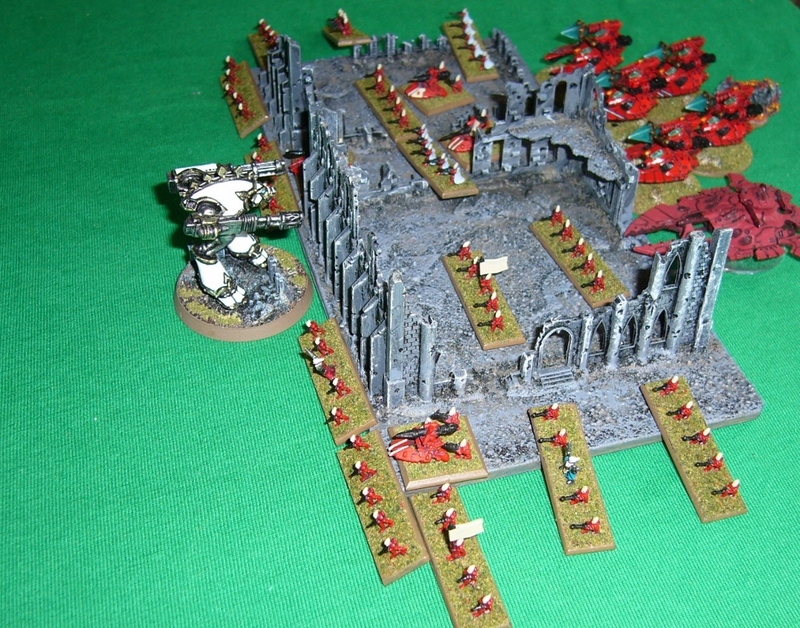 Two Shining Spears are lost, and the Warlord takes two damage. 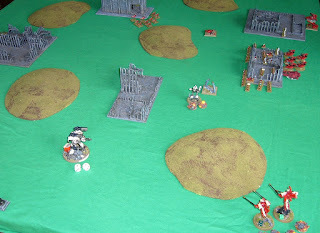 The Warlord loses combat, with suppression and Eldar Exarchs swinging the result in the Eldar's favour. 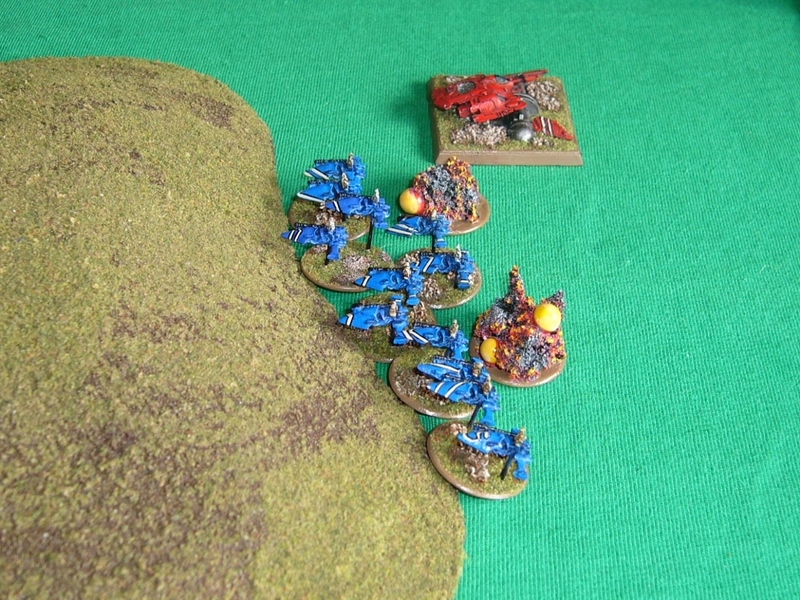 I elect to stay where I am though being a big fearless War Engine, and the bikes fly back behind a hill. 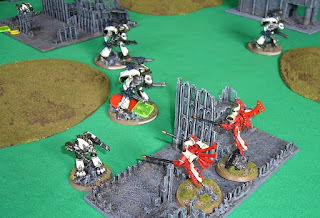 Mission successful for the Shining Spears! 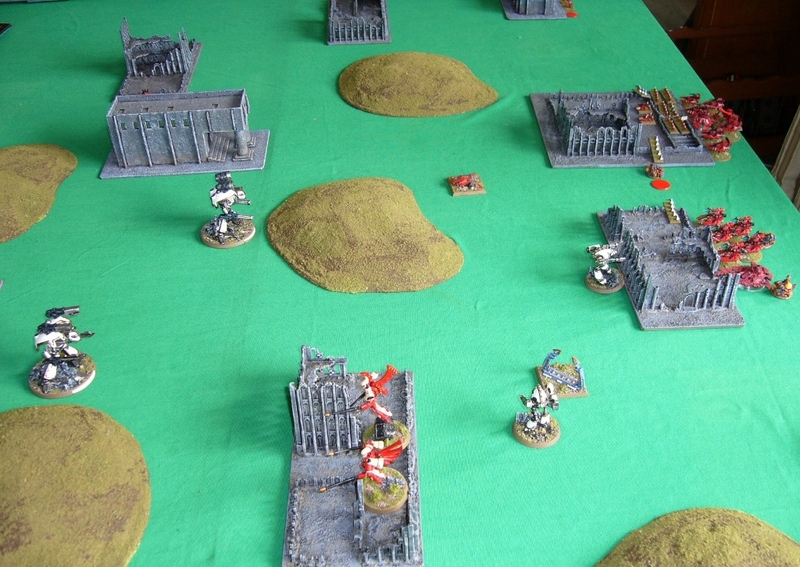 My Titans keep coming, positioning themselves for a drive into the Eldar side of the table on turn 2. 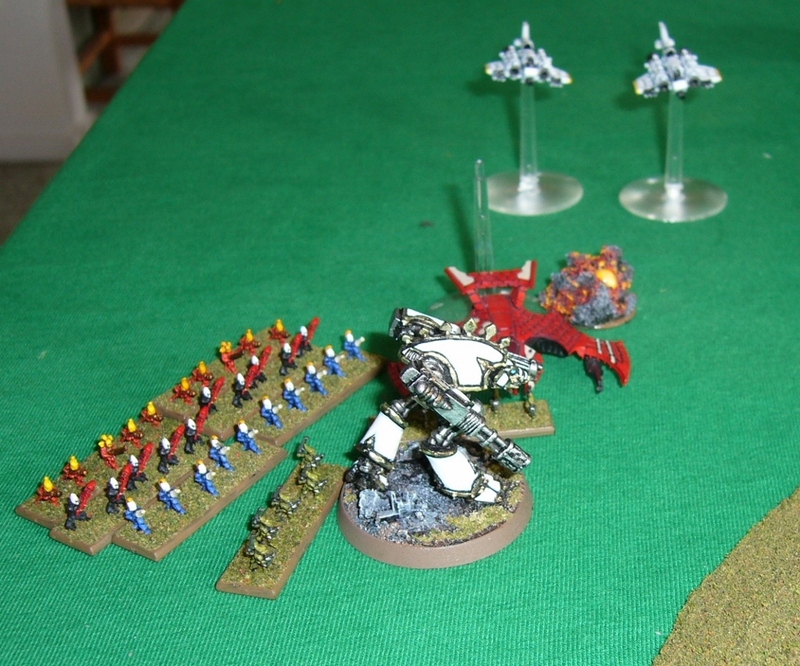 A Warhound races around the Eldar right flank. 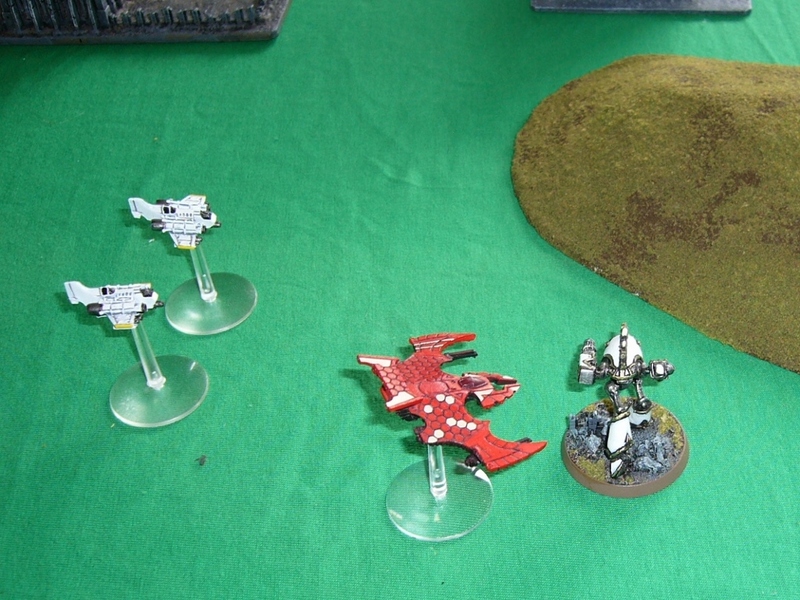 On my baseline the Eldar Vampire Transport arrives, my intercepting fighters failing to stop it. 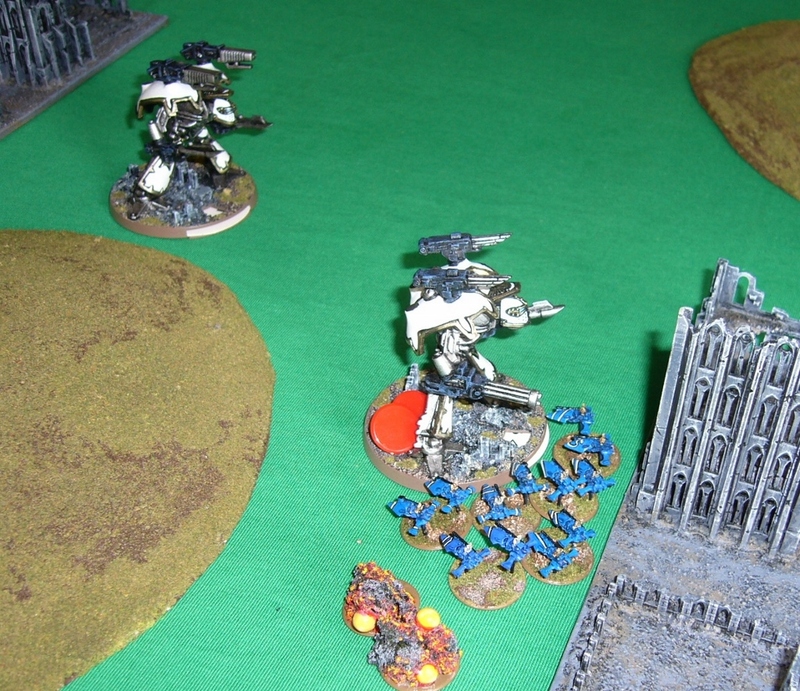 The Warhound is attacked by disembarking Aspect Warriors and loses its void shields, but does not take any damage. Nonetheless it breaks and retreats to the ruins, with the Eldar Aspect Warriors in hot pursuit. 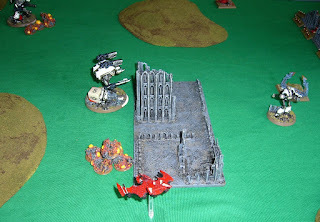 The Eldar Revenant Titans then charge forward blasting and damaging the broken Warlord, and the reactor takes a critical hit. As do the Eldar Nightwings. 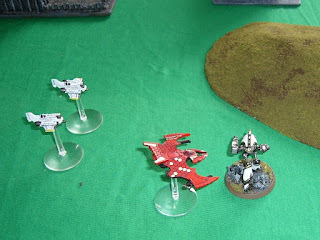 One of my Thunderbolt interceptors is shot down by Revenant AA fire, trying to intercept the Nightwings unsuccessfullly. 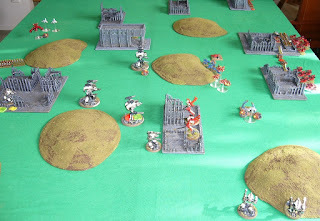 Eldar Grav Tanks race forward behind the building to my left flank and drop a couple of void shields from the nearest Warlord. Another Warhound swings around the Eldar right. 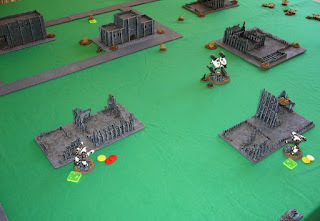 End of turn and my two broken Titans rally. End of turn 1, the right Warlord is on a single hit point remaining, with reactor still damaged, but the rest of the force is intact, and in a good position to wreak havoc on multiple Eldar formations. 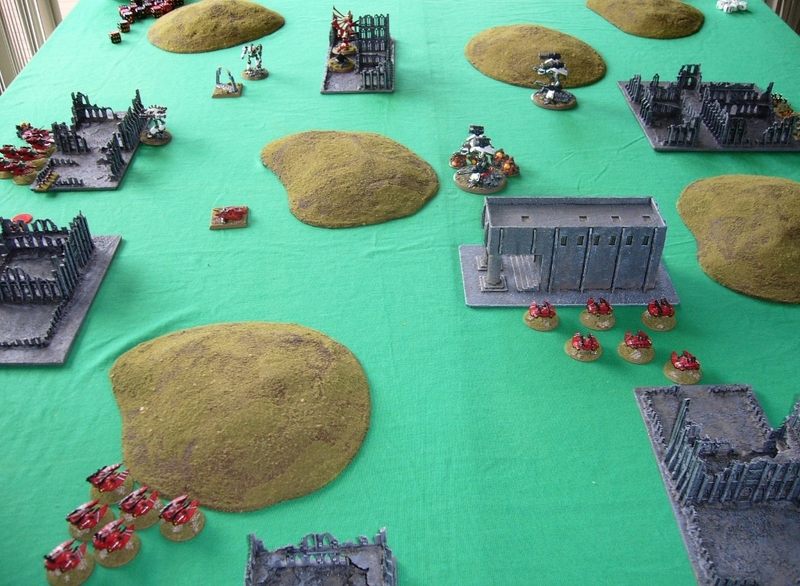 Eldar win Strategy Roll, and unleash a deadly series of attacks. 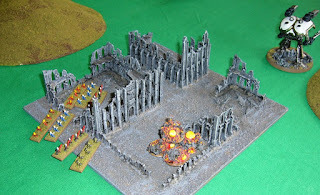 First the Fire Prisms blast the damaged Warlord and destroy it. 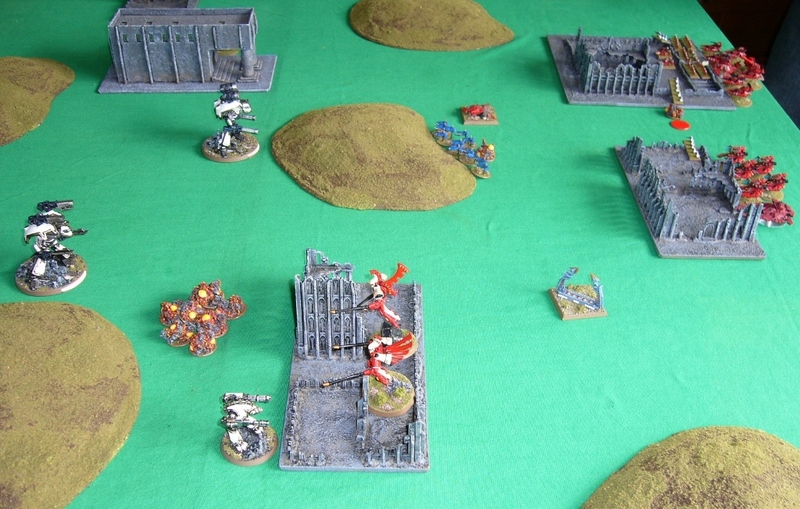 Next near my baseline my Warhound is engaged again by the Aspect Warriors and this time destroyed. 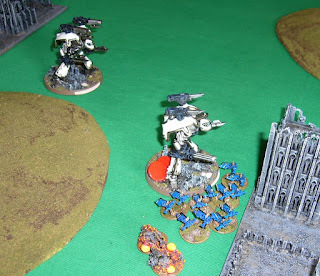 And lastly the Revenant Titans sustain fire and destroy another Warhound! 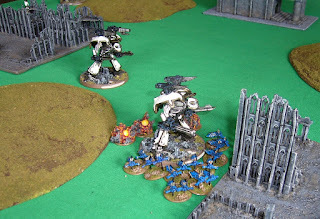 I've just lost three titans in three activations! My two remaining Warhounds attack. 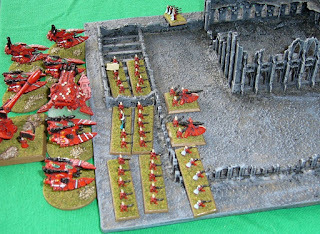 Somewhat stupidly I move the the anti-tank one to attack the Shining Spears, and the anti-infantry one attacks the Fire Prisms and Storm Serpent. 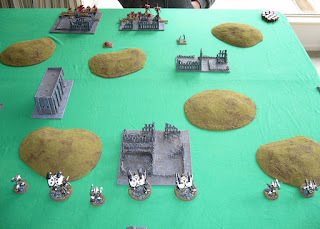 The Shining Spears take 3 losses and run away. 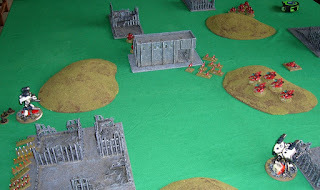 The tanks are untouched. The Eldar Grav Tanks swoop in and pepper the next Warlord with fire, dropping its shields and doing two damage. 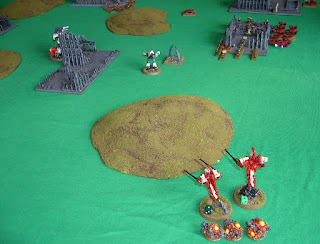 While doing Eldar hit and run attacks to stay out of line of fire. 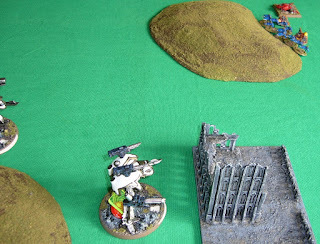 The Warlord attempts to marshal, falling back towards my now exposed blitz objective. 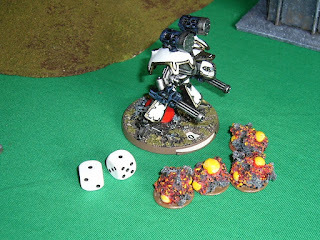 Unfortunately it rolls double one and so only regains a single void shield! 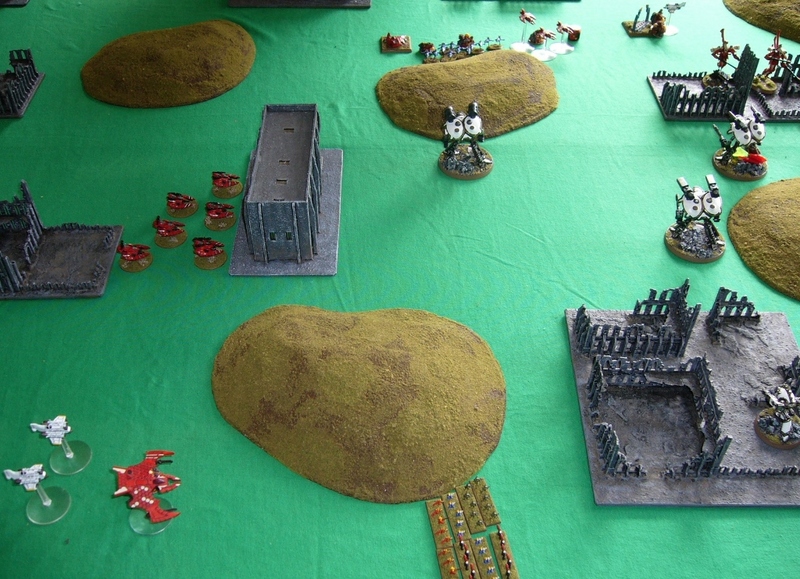 My remaining Warlord, with two Laser Burners, assaults the Revenants in a firefight - damaging each one, breaking them and causing them to retreat. 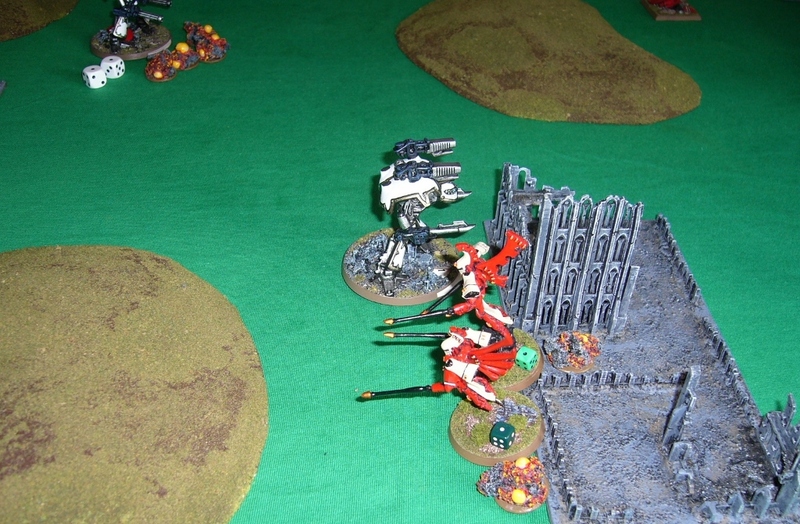 Eldar Guardians engage another Warhound and it breaks and retreats minus its void shields. It is then attacked by the Eldar Vampire. 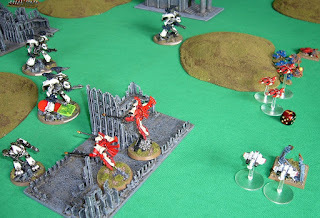 My retreating Warlord is hit by Nightwings and even Vyper jetbikes join in. End of turn and my forces have been decimated! 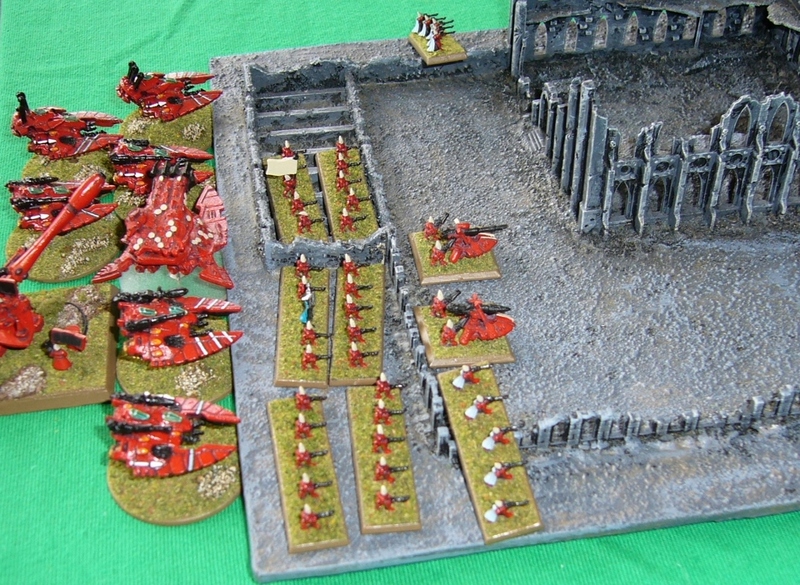 The Eldar are largely untouched. 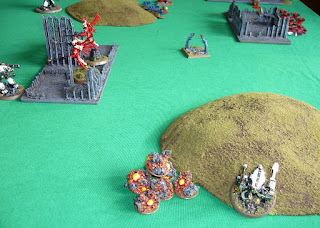 Eldar win strategy roll and the Fire Prisms race forward and finish off the damaged Warlord near my baseline. Ouch. Stay away from these if you're a Titan! 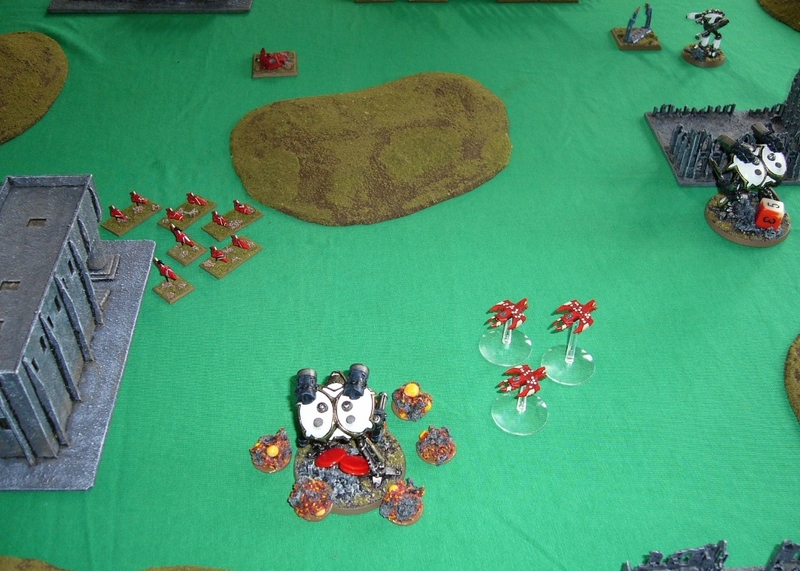 My Warlord doubles and fires it's volcano cannons at the Revenants, but rolls a double one to hit. 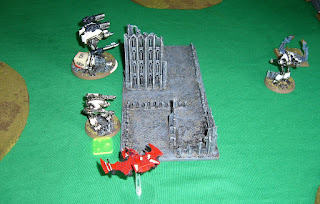 My Warhound wrecks a grav-tank formation. 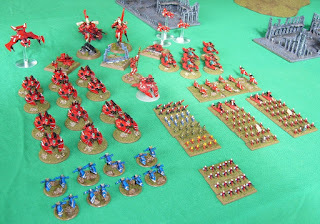 At this point the Eldar have many activations left and I'm down to two titans... I concede. 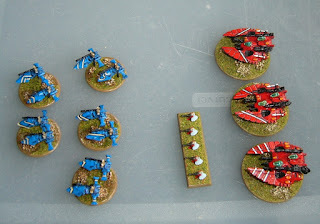 Well that was an even worse performance than the last game! 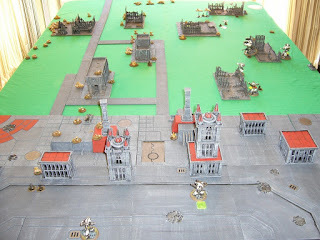 Time to analyse this a little! Eldar have a lot of good anti-titan weaponry, but Tim's force was perhaps only slightly above average in anti-tank ability for an Eldar force, and that was only part of the difficulty. So what went wrong? 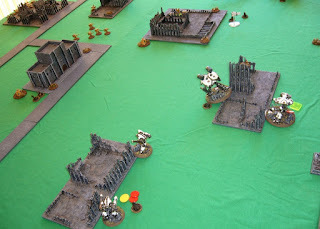 As Tim agreed, the first turn set-up by the Titan force was good and all set for some devastating strikes exploiting the Eldar placements on turn 2. 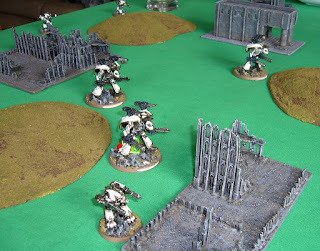 Perhaps I could have kept them a little closer for mutual firefight support in the centre but not a big issue. 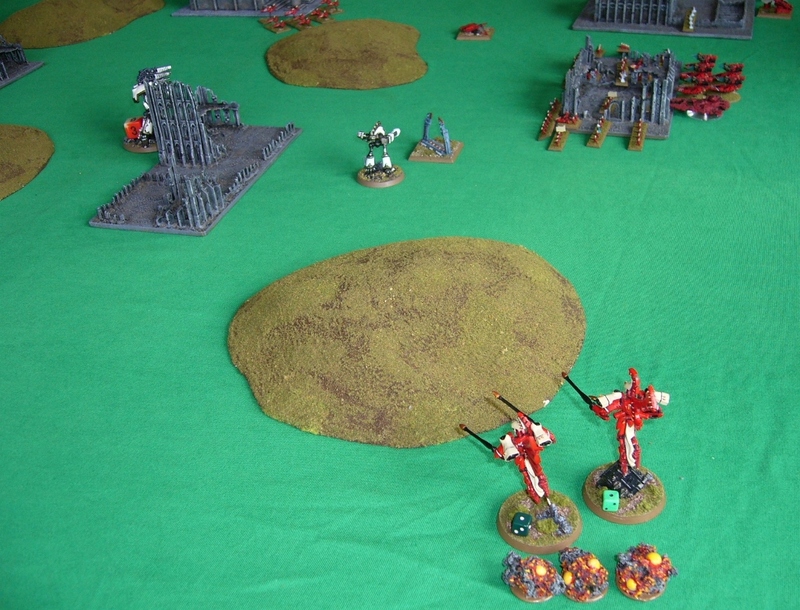 However the pre-emptive attacks by the Eldar winning Strategy Roll turn 2 (which was most likely), ended up being very destructive - knocking out three titans, and it was always going to be a hard ask after that. 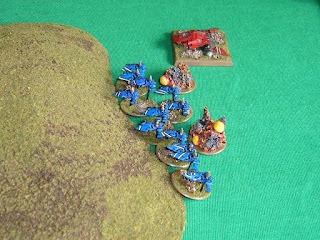 Things weren't helped though by wrong choice of targets by the Warhounds subsequently, and wasted marshal move by the Warlord. 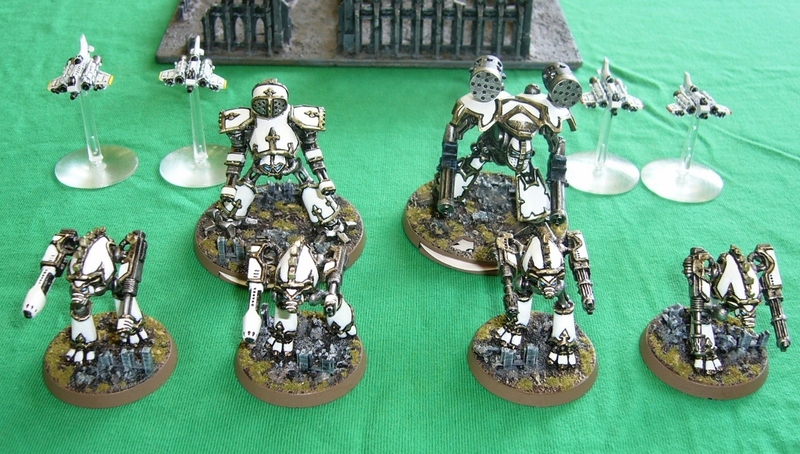 I should have concentrated on the Grav Tanks at least, as they subsequently wrecked my Warlords and I could have neutralised two or three units of these. 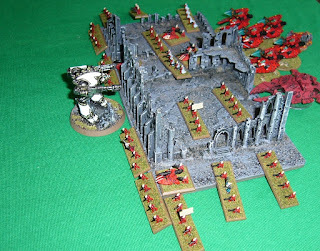 This would have at least given me a better chance to hold on against lesser threats afterwards. Also, I skimped on points and didn't add carapace multilasers to a Warlord, which would have given me some much needed anti-aircraft protection beyond just the Thunderbolts. And at 4000 points three Warlords was probably a bit too much, limiting my numbers of activations. Ah well, learning points for next time! 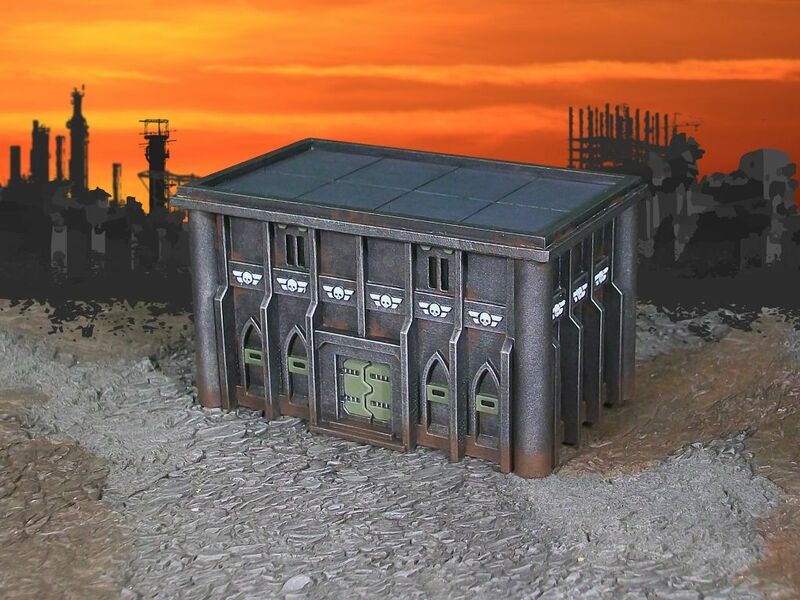 Just a quick note that Wasteland Studios is having a sale of their 6mm sci-fi buildings until the 27th August. 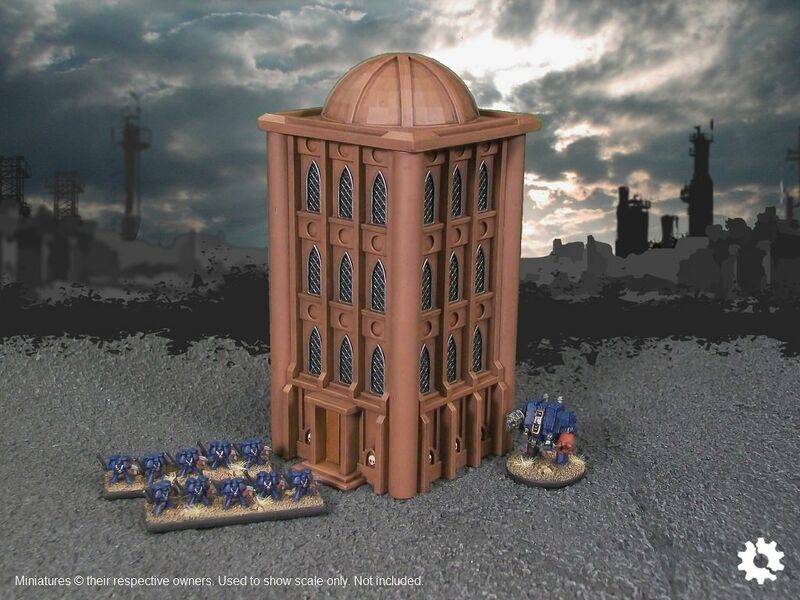 I picked up some of their buildings in their recent kickstarter, very nice! 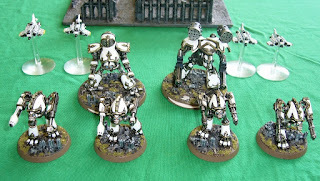 I must get around to assembling them! 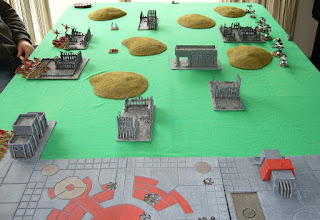 I've been busy with house purchasing and shifting over the past couple of months, but had my first game against Andrew's Tau in the weekend. I decided to take a Titan Legions list to see how the Tau would handle them. 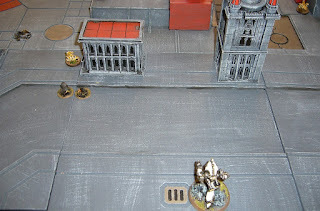 Andrew was using his Vior'la Tau again. 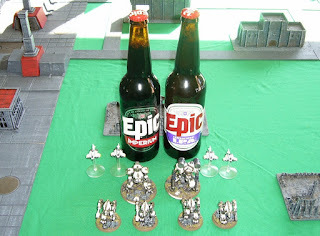 And the perfect accompaniment to the game of Epic Armageddon - Epic Imperium Stout and Epic Armageddon Ale! 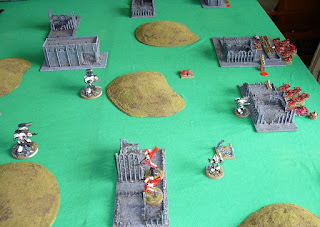 Andrew won the dice role for set up (we had equal Strategy Rating), and chose corner deployment, taking the upper left. I was in the lower right. 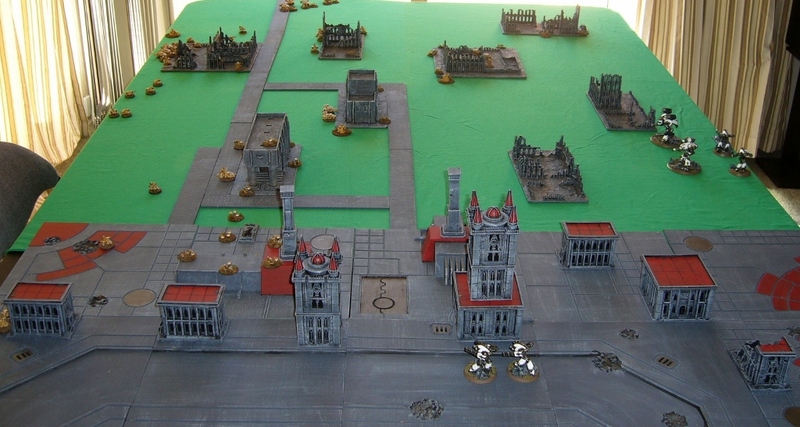 I placed my two anti-infantry Warhound Scout Titans (inferno guns and megabolters), in the town (bottom centre), and the rest of my force is up near the middle right of the table. The Tau garrisoned across their half way line (diagonal) and with plentiful reserves. 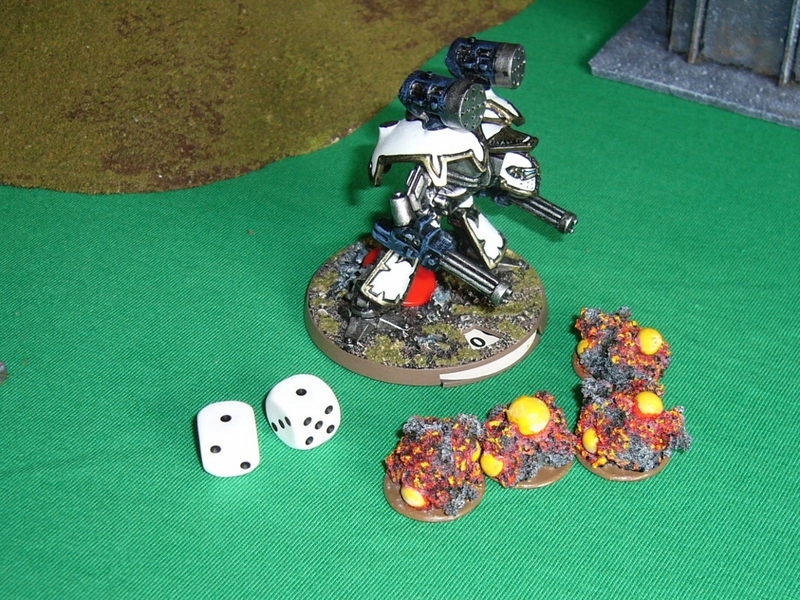 Tau won the Strategy Roll, and a coordinated fire mission from three formations near the town broke one of my anti-infantry Warhounds, though did not damage it. 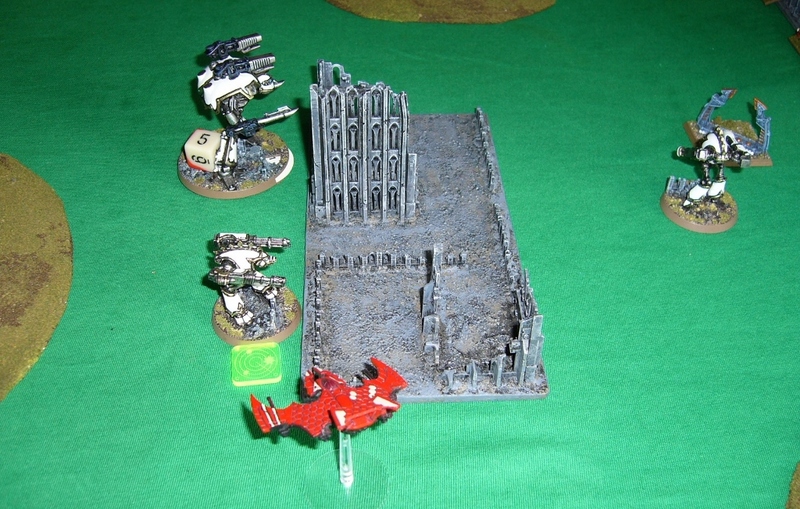 My Warlord advanced and killed three broadsides in the ruins to it's front right. 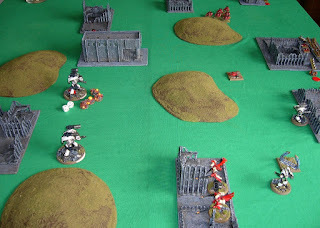 The rest of my Titans advanced and fired, but did little damage to the Tau infantry taking cover in the various ruins and buildings. 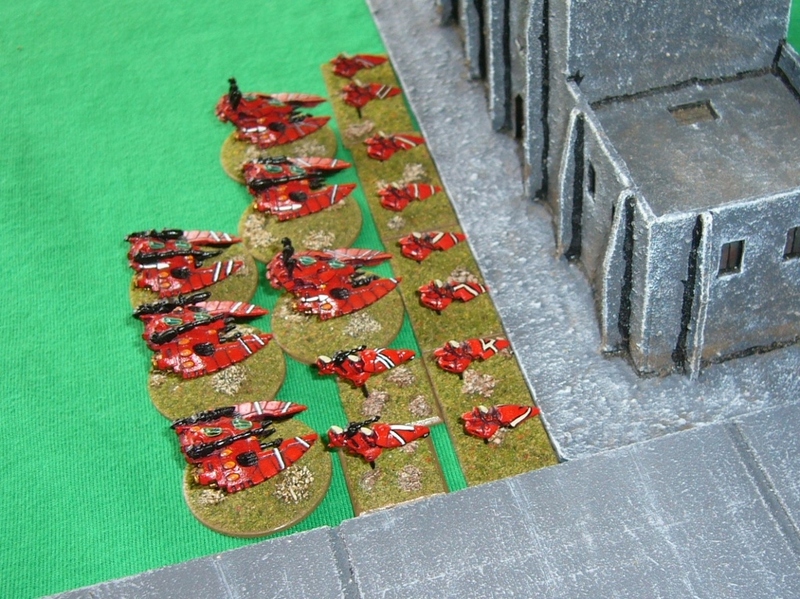 Our aircraft effectively neutralise each other. 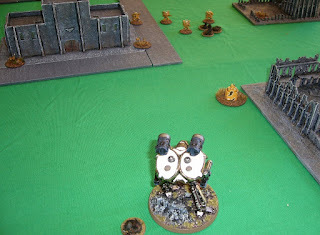 The Tau then managed to bring down the shields of the Reaver, and hit it with their Spacecraft, damaging the reactor and leaving it on just one hit point! 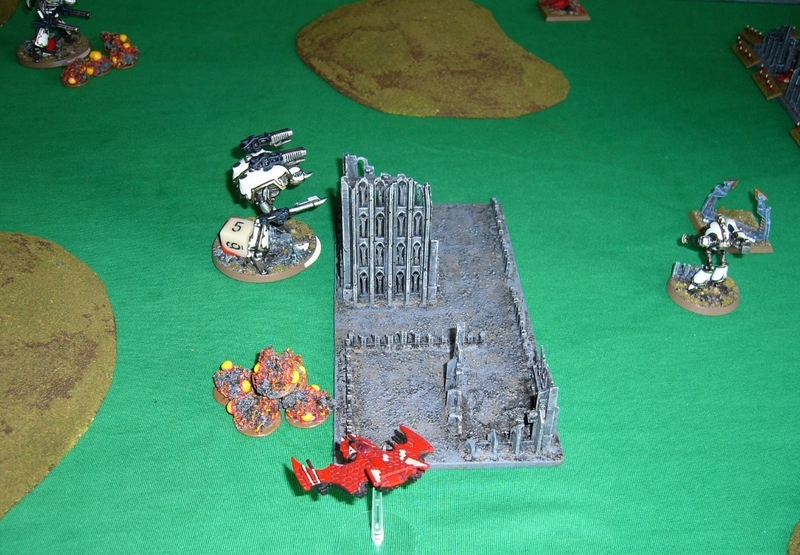 The Reaver is destroyed in the end phase by reactor damage and my broken Warhound fails to rally. Not a great start for the Titan Legion! I win Strategy Roll, and the Warlord advances and blasts another Broadside unit, killing two of them. A Warhound advances and kills another three of the Broadsides. However Tau retribution is swift and the two Warhounds are broken and retreat behind cover, shields down and one having lost two of its three damage capacity. 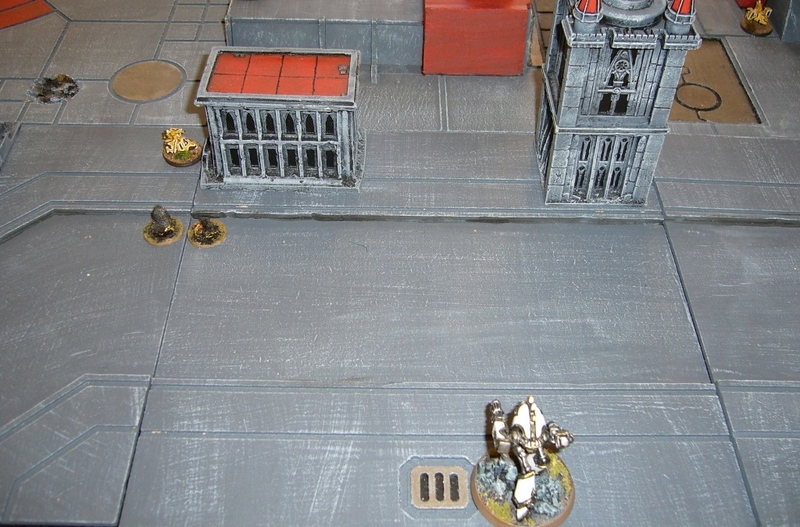 My Warhound in the town blasts some Tau recon units, but only manages to kill one of them. End of turn, and two of my three broken Warhounds rally. 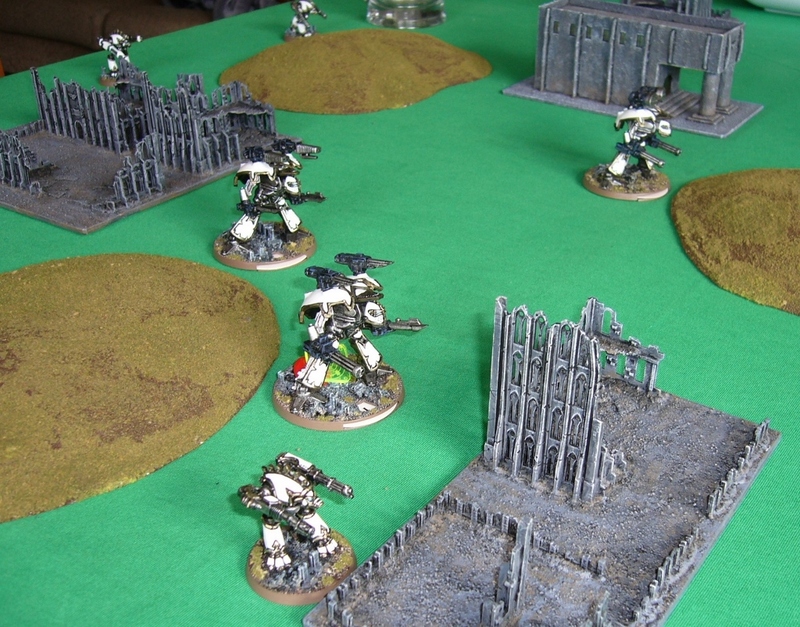 Titan Legion are thin on the ground. 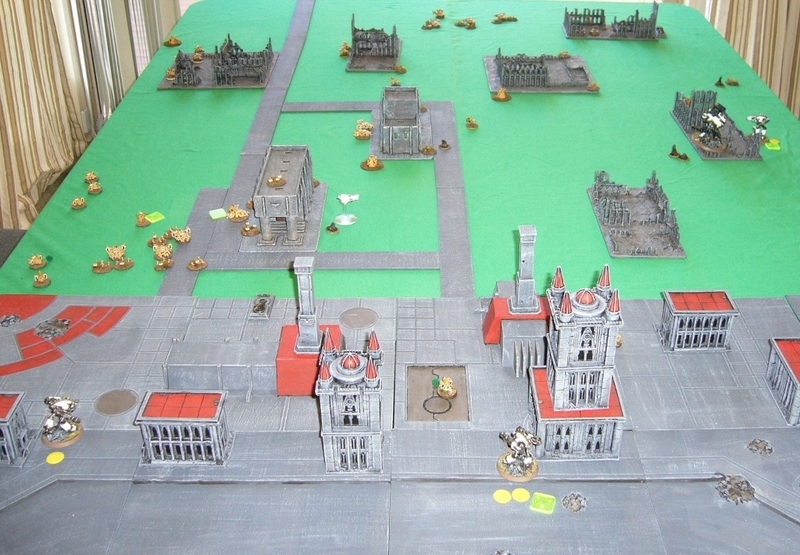 I retreat the Warlord back to guard the blitz objective, it's fire sadly doing little to the infantry in the buildings ahead of it. My unbroken Warhound in the town also manages to break the Fire Warrior formation in here, but can't get close enough to contest the objective. The Tau then finish off another Warhound, and break another, leaving me out of activations except for aircraft. 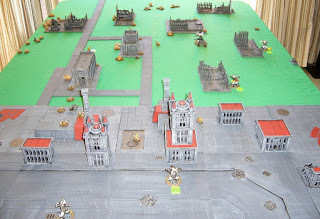 The Tau win 2-0, with Take and Hold (capturing two of my objectives), and Defend the Flag (holding all three of their own objectives) victory conditions. 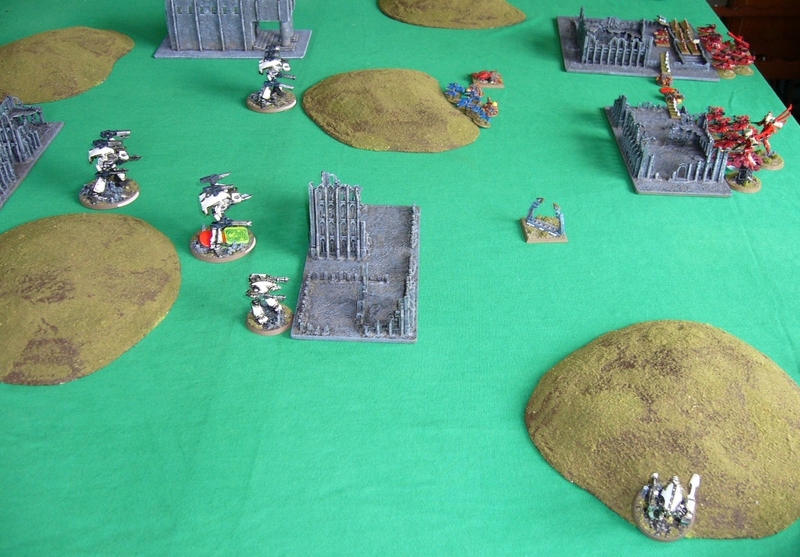 Losing the Reaver turn one was an unexpected nasty surprise. Damn space ships! 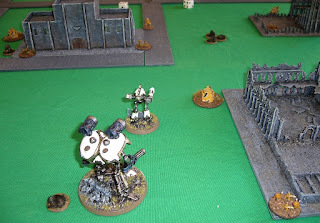 Once again the Tau prove a very tough to crack. 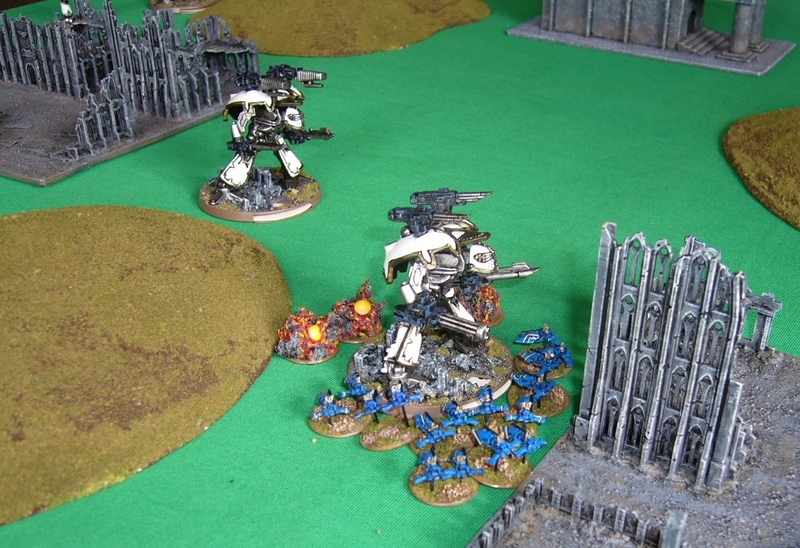 Titan Legions give you a feeling of invulnerability initially, but are vulnerable to being out-activated and maneuvered and losing on victory conditions as happened here. Well done Andrew.